I flew to South Africa on May 6th, 2016. This is my second time in the country. The first time was back in 2014, for a short visit in the area around Cape Town and Stellenbosch. I came for a conference and I stayed a few more days, for a walk in the Fynbos, some wine tasting, a cage-dive with white sharks, a hike up Table Mountain. This time I am in Pietermaritzburg, and I will stick around for a while longer: I got a research position for three years. Despite the townships built along the freeway in the outskirts of the city, Cape Town felt very European, very white. Pietermaritzburg would have been different, as I was already told before leaving. When I was still in Switzerland, a colleague of mine (a New Yorker who did some fieldwork in the area) told me: “Maritzburg is nothing like Cape Town and the Western Cape. It is in the province of Kwazulu-Natal, that is like saying ‘deep redneckland’. People like to brawl there. Not because they are violent. They are nice people. It’s just that a night out is not round if they don’t pick up a fight. It’s like a bonding behaviour”. 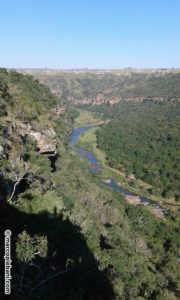 Another good friend of mine put it more elegantly: “If I had to describe Kwazulu-Natal with one word, that would be: free. Things are not as organized as in Switzerland, but they are also way less square. You will like it”. And again: “You will love the country. Or after two weeks you will want to run away” (a colleague from Durban); “Get ready, man. It is South Africa, but it’s still Africa” (a Capetonian friend). Time came to go and check first-hand. Milan-Dubai, Dubai-Durban. I landed in the afternoon, I did not feel like driving in the night to Pietermaritzburg, so I took a cottage near Durban “King Shaka” International Airport. I had to refresh my skills at driving “on the wrong side” of the road and of the car on a dirt road running through the sugar cane fields to a place called “Shapes of Africa”, where my cottage was. There I met a Zimbabwean girl, one of the 1-2 million Zimbabweans currently living in South Africa, who gave me further insights about the country. She told me that people here are still divided: people still label each other (and theirselves) according to the apartheid-era categories of Blacks, Coloureds, Indians, and Whites. She told me stories of when she first came to the country, of how she was at service in a white family in the north, of how they fired one of their servants and tore the toilet seat off the floor because the man used it, and the man was black. That was in the early 2000s. After that, she left the job and moved to Durban. The more people I speak with, the more I hear that racial issues are still big, and they are not only between blacks and whites. There is also tension between black South Africans from different ethnic groups, and between South African blacks and black foreigners. During my first days in the country, I keep wondering how things changed from before 1994. How those that are old enough to remember dealt with the change? How was to be a child during apartheid? How strong is the weight of history in those too young to remember first-hand? Pietermaritzburg is a strange city, african and european at the same time. The centre has shops and public utility buildings; buildings are a few storey high, mostly ugly, and besides the old City Hall I do not notice anything architectonically interesting or appealing. Around the centre are the residential areas, more or less fortified for fear of burglars. Walking outside after dark can be dangerous. A MSc student in our group got mugged and beaten up a few days ago, and another aggression at gunpoint made the headlines recently. It is quite a change from the security of European streets. Yet, perhaps disturbingly, people get used to it. 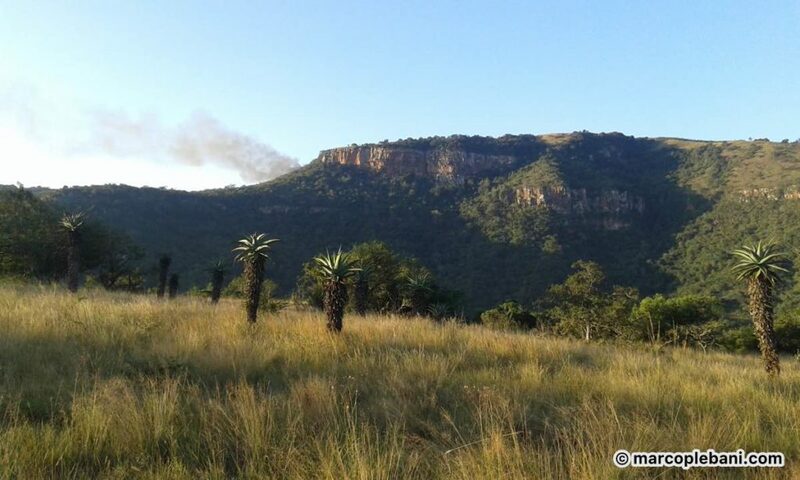 Outside of the city, it is Africa. Vervet monkeys are quite common in the suburbs, and it is enough to drive a few kilometers in the country for having gazelles and giraffes by the side of the road. 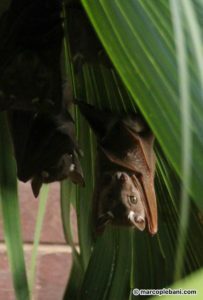 Fruit bats out of my office building. This entry was posted in Outdoors, Photography, South Africa by Marco. Bookmark the permalink.